The Trump administration is moving to ban bump stocks, like the one attached to the rifle above, which allow semiautomatic weapons to fire rapidly. Under a new federal rule announced Tuesday by the Justice Department, bump stocks will be redefined as "machine guns" and therefore outlawed under existing law. The new regulations, which were signed by acting Attorney General Matthew Whitaker, will take effect 90 days after being published in the Federal Register. A Justice Department official said that would likely happen Friday. Current bump stock owners will have the 90 days before the new rule takes effect to either destroy the devices they own or turn them in to the Bureau of Alcohol, Tobacco, Firearms and Explosives. Justice Department officials say they don't know exactly how many bump stocks are privately owned, but they estimate the number in the tens of thousands. The move has met with mixed reactions from gun rights groups. In an emailed statement, the NRA said it is "disappointed" that the new rule doesn't include an amnesty, which would have allowed people who bought the attachments when they were still considered legal, to keep them. Gun Owners of America went further, promising a lawsuit. In a statement, it called the administration's move "arbitrary," and an unacceptable reinterpretation of the federal laws against machine guns. 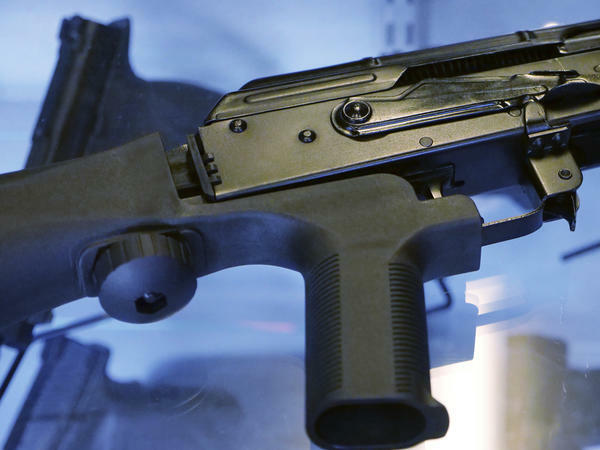 In the past, the GOA has said that banning bump stock attachments could lead to the eventual banning of semi-automatic rifles. Shannon Watts, founder of the gun control group 'Moms Demand Action for Gun Sense in America,' welcomed the rule, saying it may signal a new openness on the part of the administration to tighter firearms regulations. "We're very hopeful that we can go in now, in January, and put forward something like a background check bill, a bill that would close the loophole that allows unlicensed gun sales without a background check," she says. "And have President Trump sign that into law." But Watts says she would rather have seen bump stocks banned by an act of Congress, as some Democratic members of Congress proposed in the weeks after the Las Vegas massacre. In previous years, federal firearms regulators ruled they could not ban bump stocks under existing federal law. Las Vegas caused the Trump Administration to order the ATF to review that decision. The Justice Department followed up by proposing a federal rule change that would reclassify bump stocks so they fell under the definition of a 'machine gun,' as it's now doing. Fully automatic machine guns are strictly controlled in the U.S. It is illegal under federal law for a private citizen to own a machine gun that was manufactured after 1986. Regulators at the ATF have become increasingly preoccupied with vetting a wide variety of attachments for guns, some of them created with 3D printing technology. Last week the agency announced a policy requiring any new accessory needing evaluation to be submitted to the agency along with the firearm it's supposed to modify, to make it easier for the ATF to test it.